It was an injured goat that brought two survivors together after the powerful earthquake that shook Nepal on May 25. Shankar Sapkota, a paravet working with Animal Nepal, lost his home in Sindhupalchowk district. After building a shelter for his family, Shankar joined one of Animal Nepal's outreach teams. That was how he met Sarita. When Sarita joined classes in Dhading a few years ago, she was gifted a goat by a sponsorship program that encourages education for girls. Sarita named the goat Sani. Sani gave birth to two kids later that year. The family also owned some chickens and a buffalo. "Sir, please save my Sani ... all our animals are dead ... we can bear the loss of our home but not of our animals." The 7.9 magnitude quake left around 600,000 families homeless. A preliminary survey revealed that close to 150,000 birds, 8,000 buffaloes and cows and 14,500 pigs and goats died. The number however went up after the strong aftershock on May 12. The bond between people and animals is a strong one in Nepal. Livestock are often kept on the ground floor of the homes, and a family member stays with the animals throughout the day while grazing. A mother with one surviving child begged relief workers for a tarpaulin to give shelter to her cow. "The cow is the key to our survival," she argued. "If I die my child can survive with the milk from the cow. If the cow dies we both are as good as dead." Animal Nepal's teams returned with heartbreaking stories from their visits to the worst affected districts. Although most team members experienced personal losses, being able to save some of the surviving animals lifted their spirits. "I myself am staying in a shelter covered with a tarpaulin waiting for relief. Sometimes it's frustrating to work with these worries but I get power from what I do. Helplessness is the worst thing in the world. Being a paravet is a gift. The animal's pain is no less than mine or possibly even more. Helping them gives me mental and emotional relief." Shankar was especially touched by a farmer who pointed out to a nearby hill to show the rubble of his house. With a big smile on his face, the farmer said: "Thank God some of my animals survived thanks to your help. This allows me to restart my life." 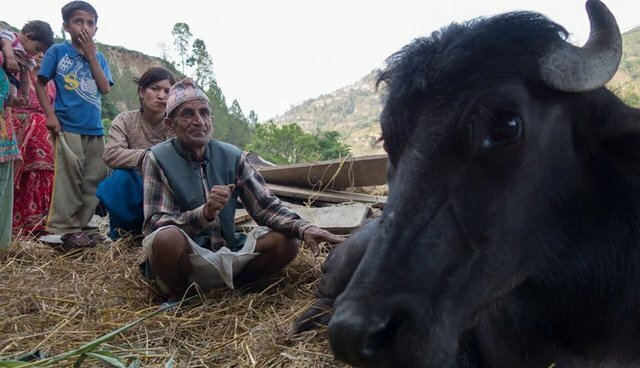 Animal Nepal, with the support of World Vets, treated 400 animals in four districts, and provided support to 500 equines working in brick factories. Relief goods were handed out with the support of The Donkey Sanctuary and Burns Violence Survivor. In order to build local capacity, protocols on limb casting and downer cows were developed and workshops organized. Various international organizations have come to the rescue too. Though life in Nepal is limping back to normal, the risks still prevail. Aftershocks and landslides hampered the work of the outreach teams. Due to stress and sanitation issues, livestock were vulnerable to infectious diseases such as bird and swine flu, foot and mouth disease and respiratory problems. Shankar continues to treat injured livestock. "The animals' lives are entirely in our hands. In a family it's the responsibility of the head to protect the members. Likewise it is our responsibly to protect the earth and its children," says the committed paravet. Sadly Sarita's goat did not make it. But Animal Nepal plans to return to her village to build earthquake resistant animal shelters. Shankar is committed to help families like Sarita's: "Making sure the animals are safe and healthy is one of the greatest gifts we can give to the survivors." With input from Chadani Lama.